We make everything to order, which can be very special if it’s a Moses basket, because we’re making the basket especially for your baby. The standard inside base measurement of 75cm x 41cm is quite generous for most newborns and up to the age of about 5 or 6 months. 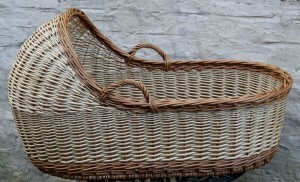 We can make the basket smaller or larger and in either buff or white willow. We also know of an online company who custom-make Moses basket mattresses in a selection of materials at reasonable prices. The price for the standard size (external measurements about 79cm x 46cm) is £105 plus p&p £13.